I was ten years old when I tasted my first Rice Krispie Treat. It was Kathy Duffy, our favorite babysitter, who taught me how to make them one winter evening. Kathy was a rockstar babysitter, the type my sisters and I waited for in our pajamas eagerly by the door, wondering what new game or craft she would pull out of her giant floppy purse. One night she surprised me by pulling out something edible, a bag of cereal and some marshmallows, and with the addition of a little butter from our fridge, she showed us Frenchies how those three ingredients come together magically. I gorged myself on that first batch of Rice Krispie treats. Hot from the pan, I licked them off my fingers, amazed that something so good hadn’t come out of a boulangerie. Now my kids are the ones eating the Rice Krispie treats straight from the pan, making magic by bringing together marshmallows, butter, and Rice Krispies with a little heat. 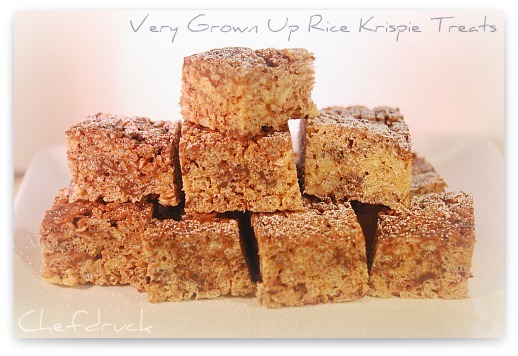 But this holiday season, I wanted to make Rice Krispie Treats my own again, by turning them into a grown-up treat. I started with Smitten Kitchen’s salted brown butter version, as recommended to me by my friend Alma. Without this amazing recipe as a base, the ratios would have been all wrong. Then I added coconut and dark chocolate, two of my favorite dessert treats. The result: a decadent grown-up Rice Krispie Treat. More gooey than traditional Rice Krispie treats. Every bite filled with rich caramel and dark chocolate overtones. I just wish I had a cookie exchange to attend this year to dazzle everyone with my creation! I’m working with Kellogg’s Rice Krispies this December to inspire home cooks everywhere to create their own version of Rice Krispie treats this holiday season. To help spread the word, Kellogg’s has given me a $100 Visa gift card to give away to one of my readers. Post about this contest on your Facebook page. Post about this contest on your blog. I’ll select the winner at random using Random.org after midnight on Tuesday, December 21. The winner will have 48 hours to respond, or their entry will be void and I will select another winner. There are 30 different Rice Krispie Treats $100 Gift Card Giveaways being coordinated by The Motherhood this December. You may only win one gift card across the 30 blogs. Abbreviated Rules. No Purchase Necessary. Begins no earlier than 12:00:00 AM (ET) on 11/29/10 and ends no later than 11:59:59 PM (ET) on 12/21/10. For complete Official Rules, go to http://web.mediacdt.com/docs/motherhoodholiday. Open to legal residents of the fifty (50) United States and District of Columbia who are 18 years of age or older at time of entry. Subject to complete Official Rules. Void where prohibited. Sponsor: The Motherhood. Head on over to the Motherhood for the full official rules. Grease an 7×12 inch rectangular Pyrex pan with 2-inch sides. Line with plastic wrap that is three times as long as the pan. Leave the extra wrap hanging out of the pan. In a large pot, melt butter over medium-low heat. Make sure you pick a large pot, or you will have a sticky mess of Rice Krispie overflow all over your counters and floor. The butter will melt, then foam, then turn clear golden and finally start to turn brown and smell nutty. Use your nose to guide you! When it smells good, slightly nutty, and is a pretty golden brown, the butter is “noisette” and ready. Don’t wander off, because your browned butter can and will turn to burnt butter in less than a minute. As soon as the butter is ready, turn the heat off and stir in the marshmallows. If the warmth of the melted butter is not enough to melt the marshmallows, turn the heat back onto low to help it along and get the marshmallows smooth. But again, be careful not to burn the butter. Remove the pot from the stove. Pour the salt, Rice Krispies, coconut and chocolate chips on top of the melted marshmallows. Take a deep breath and get ready to work stirring. This is the hardest part of the process as you’ll have to burn off a little sweat equity stirring the pot. Quickly spread the mixture into the greased pan, on top of the plastic wrap. Then cover the top of the treats with the extra plastic wrap, and press in the mixture as hard as you can. I even like to use a small pot to push it in smoothly. 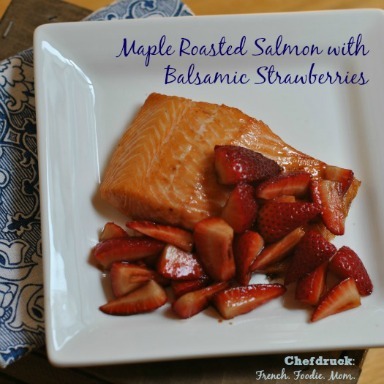 Cool at room temperature, or if you have some impatient kids (or adults) in the fridge. Store in airtight container. Will keep for 3-4 days. >I love freshly made original treats dipped in chocolate. >I love them for breakfast with bananas! >I am so glad I saw this. For some reason I wasn't a fan, yet, on FB! But, now I am!!! >I love my Rice Krispy Treats with the browned butter, and with a chocolate chip placed atop each piece! >I follow you on Twitter! >I have never experimented with rice krispie treats beyond the original recipe. Your adult version looks fantastic and maybe I'll try it soon. Needless to say, my packet of rice crispies get over very soon! >I have never made them any way but the original..boring, I know! I am going to have to try yours now…they sound so good! 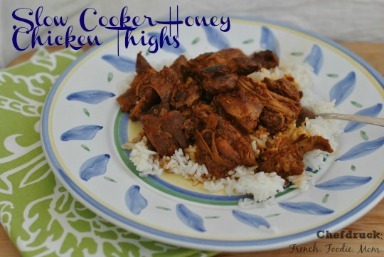 >Mmm – I love that recipe from Smitten Kitchen. I also sometimes get them from the gym across the street – they're just perfect and really thick. >I like mine best straight up, but they're nice with M&M's mixed in too. >These are sure great ideas! Thank you! I have to share that I have been saving on ingredients. I found an auction website that auctions off pre paid Visas, and giftcards for major department stores. I bought a $100 Walmart giftcard for $8.50! >I like to add peanut butter and chocolate. I follow you on Twitter. >I like to add M & M's to my rice krispies treats. >I subscribe to your emails. 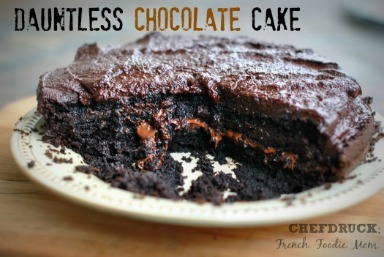 >I love my treats drizzled with melted chocolate! >I tasted these today and they were amazing! 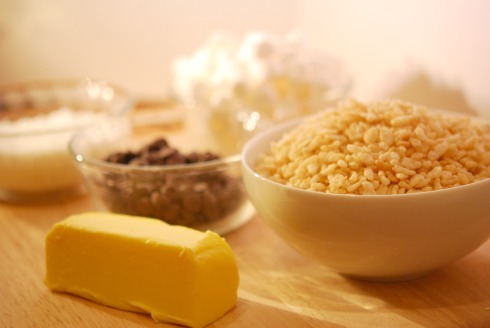 I have always been grateful to Rice Krispie treats because back when my daughter couldn't eat wheat, egg or dairy, we could make her dairy-free RKT using margarine as a dessert. >I like to drizzle white chocolate on them and crushed candy canes. >I've only had original Rice Krispie Treats…which I love, but I've also made them with Cocoa Krispies. Thanks! >I like mine with peanut butter. I'm a subscriber. Thanks! >I subscribe by email. Yum yum to your recipe! >I like mine with chocolate chips. My mom once made some that had several varieties of nuts and oatmeal, kinda trail mix style that were pretty good too. >I like to have my Rice Krispie treats with chocolate chips! >I like my Rice Krispie treats with melted chocolate/butterscotch chips on top. yummy! >I like original rice krispie treats, although they do taste good with added chocolate chips. >My son likes them with M&Ms mixed in. by the way, I made these today…soooo good! >i just throw in some white choc chips and enjowy with soy milk! >I like the original recipe for Rice Krispies Treats the best. Thanks for the giveaway. >Grown up eh?? LOVE it! My fave are with butterscotch chips in there!! YUM! >I like them plain or with peanut butter and chocolate. I think that my kids would enjoy your recipe. They would just love coconut in their Rice Krispies treats. >Hmm…for some reason my comments aren't going through:-). Anyhow, i've tried the original receipe but now i'm inspired to try butterscotch chips or toffee. >I like the regular Rice Krispies treats…but a little dab of peanut butter is something I love in the mix. >I like my Krispie Treats as is, using the same plain recipe that I've made since childhood. They're addictive. >I usually just make mine the plain style but these recipes are intriguing. I follow @Frenchfoodiemom on twitter as willitara. 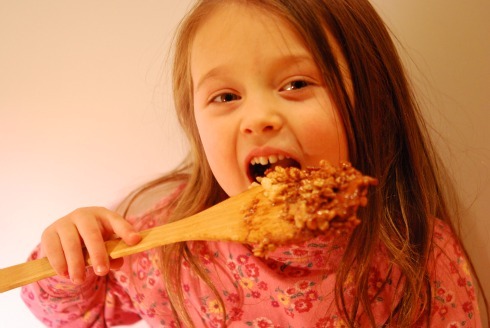 >My favorite rice krispie treats are my mom's recipe … memories baked right in! They are traditional with added green food coloring and decorated with red cinnamon dots. >I love peanut butter Rice Krispies Treats (made with pb, karo syrup and sugar) topped with chocolate! YUM!